These longer trips are true vacation adventures! Learn to apply new found navigation skills and gain the paddling confidence these extended trips provide. Visit several islands from base camps you will set up along the way. Enjoy healthy, northwest influenced meals prepared and served by your guides or choose to cater your own trip and save a little money. Watch the cold fire of bioluminescence light up the sea, or paddle out for a moonlight excursion. Glide silently through the intertidal bays, reflect, relax, hike or fish as you explore these beautiful islands. As each day passes, your heart will get lighter and your smile will get wider. Private trips available to book now. Contact us for more information! We love this trip! Avoid the ferry hassles and enjoy this mountainous island that offers wildness unsurpassed in the San Juan archipelago. Cypress Island is the largest undeveloped island in the San Juan Islands and there is no ferry access! Currently surveyors on Cypress Island have identified 142 species of birds (plus 50 sighted, but undocumented bird species) and over 264 plant species! And that is just above our kayaks! Love world-class biodiversity then this place is for you! (Shhhh keep it like a secret because we want to keep it this way). The two campsites we use are primitive with inspiring views of Mt. Baker, all from the window of your tent. Hike our favorite trail 1.3 miles up to Eagle Cliff where your view of the San Juans Islands will be expansive and breathtaking. If you are quiet enough you might just hear a Falcon soaring below the cliffs edge, or see Bald Eagles perched in the tree’s below. We have gone to the top of many of the San Juan Islands and this view is by far our favorite. Don’t worry if you still want more hiking, you will have nearly 15 miles of hiking trails to explore during your stay. 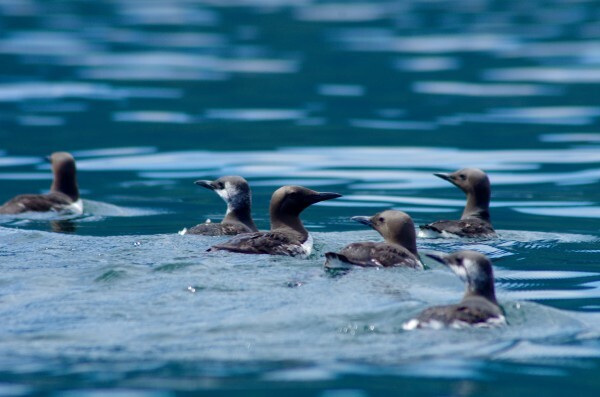 Time and weather permitting, we will paddle to Strawberry Island for a lunch exploration – keep your eyes out we often see Porpoise playing in the tidal currents surrounding this beautiful Nature Conservancy Island! 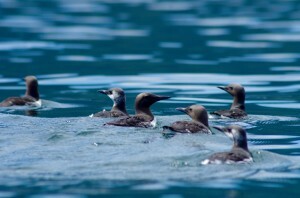 Click here for more information about Cypress Island and the Natural Resources Conservation Area. Paddling across Rosario Straight, racing diving shorebirds and looking for porpoise and other larger sea creatures! Camping on one of the most northern Islands in the San Juan Archipelago! Look there’s Canada! 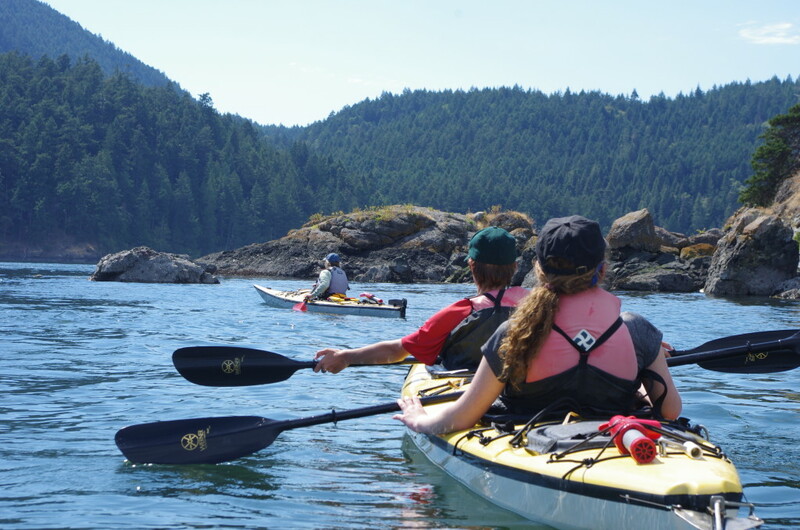 Circumnavigating Sucia Island, exploring nooks and crannies, diverse intertidal life, Resident Bald Eagles and the untouched northern coastline. Sunset paddles or Bioluminescence paddles in one of Sucia’s protected bays. GEOLOGY ROCKS! Conglomerate, Shale, Quartz, Sandstone and more -let’s go search for fossils! Potential for taking a day trip to Matia Island to hike the Old Growth Forest! No previous paddling experience is necessary. Paddlers from novice to experienced are welcome and there will be something for everyone, but you will need to be in good physical shape and be able to sit in a boat for long periods of time. Must be able to paddle for up to 3 hours at a time. Our boats generally fit folks up to 6’7″ and 265LBS comfortably. If you are near those specifications, or are concerned about comfort in a sea kayak, please give us a call. A detailed gear list will be sent to you once you have reserved your trip. Have all the camping gear already and just need a kayak guide? No problem! We offer fully-catered or self-catered options to work with your budget and preferences. Read below to see what is best for you. If you have any questions or want to customize your trip, please don’t hesitate to contact us, we love helping your adventure dreams come true! An Awesome kayak guide to keep you safe and informed on the water, share their local knowledge and expertise of the beautiful areas we explore. Looking for a quick escape from all the hustle and bustle? Look no further. These quick, yet relaxing and fun excursions are all about getting the most out of our paddle time while still being able to sleep under the stars and fall asleep to the musical rhythms of soft waves. By day we will explore the natural beauty off the bows of our boats as we adventure around some of the less traveled parts of Lummi Island. Jam packed and meant for those who are traveling on a budget or a tight schedule we offer lots of customizable options, below is our “Standard Lummi Island Multi-Day” package, keep in mind we are happy to rearrange to meet your needs for a private sea kayaking adventure! 8 miles of paddling for our first day. Beach lunch, beautiful scenery and the gentle sound of moving water as you lay your head down, under the night sky. Waking up the songs of birds chirping and coffee/Tea boiling. Enjoy a wonderful breakfast prepared by your guides (or BYO if you love doing your own camp cooking). 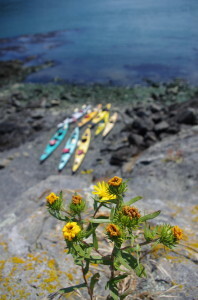 Explore the remote end of southern end of Lummi Island & all the beautiful intertidal diversity! Basque in the magnificent bluffs rising over 1,500 vertical feet up from the water! Make this a one way paddle or an out and back! If we go one way (exploring more new coastline) Moondance will shuttle you back to vehicles or choose to stay a little longer and enjoy a meal at the Beach Store Cafe or The Willows Inn. In order to keep the cost of this particular trip down, we ask that you pack your own camping gear (tent, sleeping bag, sleeping pad, etc.) and lunch for day 1. We do realize not everyone has their own gear. If you need to rent equipment from Moondance please contact us about our rental availability. See additional prices below. Professional & fun sea kayak guide to assist in your adventure! A detailed gear list as well as driving and meeting directions will be sent to you with your confirmation email, but to prepare for your trip, please click here to review our 2-3 day gear list! *Multi-day trips requires a minimum of 2 people to run a trip to meet our on water safety guidelines. Please contact us if you do not see the dates you are looking for on the book now page. -To view more trip photos please click our BOOK NOW button where you can scroll through the desired trip photos. Paddle the best islands. Dine in style. Sleep in comfort. New as of 2017! It’s time to explore the northern San Juan Archipelago in a different way. 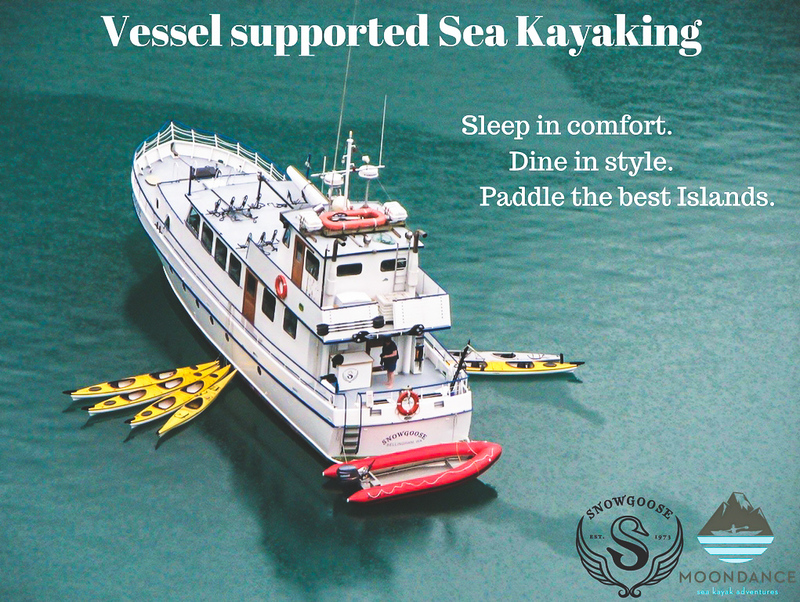 Moondance Sea Kayak Adventures has teamed up with the M/V Snow Goose to offer a multi-day kayak exploration with a twist. 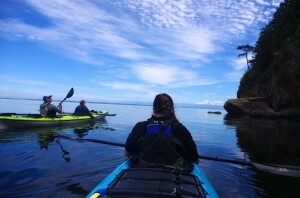 Accessing the northern San Juan Island chain in a kayak presents itself with multiple challenges, but when you’re silently gliding past the sandstone formations you’ll understand the draw. The Snow Goose is your support vessel, equipped with all the amenities you’d find at home. She will transport our kayaks through major crossings and offload you and your kayak when the time is right. Out of sight, but not out of contact, you’ll navigate unique islands with your guide until you arrive at your evenings lodging. Exhilarated with your accomplishment you’ll be ready for a hot meal and warm bed. With renewed energy, the morning is welcomed with another day of exploration to new waters. Trips only available Spring and Late Fall. 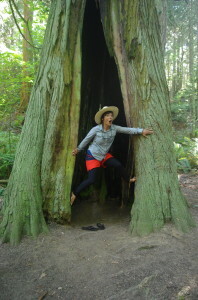 Sucia Island, Cypress Island and Lummi Island Adventures: Contact Us for more info!